(Newser) – More than 40 years after it was the centerpiece of what PRI calls "possibly the biggest and strangest covert operation" of the Cold War, a piece of CIA history is headed for the scrap heap. After the Soviet Union failed to find one of its nuclear submarines that sank 1,500 miles northwest of Hawaii in 1968, the CIA swooped in, hoping to recover both the sub's nuclear missiles and its cryptography gear, according to Reuters. Under the code name Project Azorian, the CIA schemed to raise the 14 million-pound sub three miles to the surface—an undertaking considered impossible. "I think given a better background in marine engineering, we likely would not have tried," says the retired CIA employee who finally revealed the long-officially-secret story in 2012. 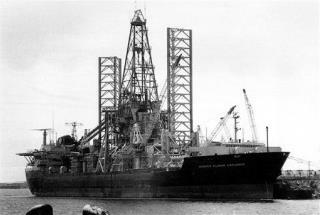 The ship that the CIA came up with—and what is now being scrapped: the Hughes Glomar Explorer. As a young man who was aboard this amazing vessel when the control room and missiles were recovered. Its a bit chilling to tell the story of how the secrecy of this op which helped the USN maintain underwater supremacy for the last 30 years. The cover story is true the name of the ship , Hughes explorer, the giant claw and the 400ft barge were unbelievable. The ship could maintain a stable position in any location and weather was not a issue. When the 300ft doors on the bottom of the hull were opened know one had a clue. On one op off sol Cal. recovered Spanish Galleon one of (6)) from the Philippines with all there cargo. About 7yrs ago visited site off Hawaii closer to big island than told. All tapes and info lost or ? . The $64,000 question: Is the ship for sale? "able to cover up the construction of the ship for four years by convincing the world Howard Hughes was building it to mine manganese nodules from the ocean floor" The evidence is right in front of us. Over and over. And the public just laps it up like they're brain dead.